One afternoon recently, I got the baking itch. 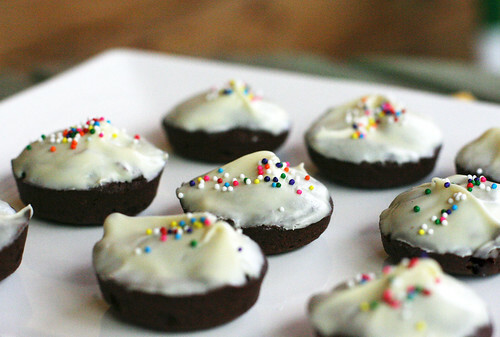 I was in need of some extra cuteness in my life (although this is always more than enough), and these sweet little brownie bites were the perfect cure. I've noticed lately that the recipes I make tend to fall into two categories: either I can whip them up easily with ingredients I have on hand, or they take a hefty trip to the grocery store and a few hours of prep time. This is definitely the former. 1. Center a rack in the oven and preheat the oven to 350 degrees F. Lightly butter two miniature muffin pans, each with a dozen cups, and place them on a baking sheet. 3. Melt the butter, chocolate and brown sugar in a medium heavy-bottomed saucepan over very low heat, stirring frequently with a heatproof spatula and keeping an eye on the pan so nothing overheats or burns. When the mixture is smooth, remove from the heat and cool for a minute or two. 4. Stir in the vanilla and egg into the chocolate mixture. When the mixture is well blended, add the flour and stir only until it is incorporated. You should have a smooth, glossy batter. 5. Spoon the batter into 16 of the muffin cups, using about a teaspoon of batter to fill each cup three-quarters full. Put 1 teaspoon of water in each empty cup. 6. Bake for 14 to 16 minutes, or until the tops of the buttons spring back when touched. Transfer the pans to racks to cool for 3 minutes before carefully releasing the buttons. Cool to room temperature on the racks. 7. Melt the chocolate in a small heatproof bowl set over a saucepan of simmering water. Stir constantly and don’t leave the chocolate for even a minute- white chocolate scorches easily. As soon as the chocolate is smooth, remove from the heat. 8. One by one, dip the tops of the buttons into the chocolate, twirling the buttons so that you get a little swirl at the center of each one and the excess chocolate drips back into the bowl. Refrigerate the buttons for 15 minutes to set the glaze. Adorable! Adding these to my cache for an upcoming bunco dessert (we do potluck) to take. Oh yum! I can see a day when I'll need to try these. I'm whipping up some lemon bars today just because it's Friday.